Today’s guest blog comes to us from AmeriCorps alum Kristen Vann. Kristen is currently a high school educator at Madison High School, a small rural school near her hometown in Western North Carolina. She did a year of national service with City Year Chicago in 2012-2013. Kristen was a School and Community Engagement Coordinator at Collins Academy High School in the North Lawndale community. When I have conversations about my year of service as a City Year Corps member in Chicago, I usually talk about how rewarding the work was. I am very grateful for the opportunities I had to tutor, mentor, and advocate for some really incredible ninth graders. Working closely with these students taught me so much about myself. It taught me how to cross barriers and form relationships with young people in a way that has deeply influenced my teaching career. I could speak volumes on how AmeriCorps has had an impact on my professional life. This intense ten-month experience not only gave me valuable experiences in community engagement and school enrichment, it also taught me to work hard and work smart. There is absolutely no doubt that my service gave me a deeply seeded sense of satisfaction, as well as many professional skills. That’s why I very rarely speak about the events that caused this work to be physically, emotionally and mentally draining at times. On the ground work can be exhausting. I can’t count the days that it left me depleted of energy. It is no secret at City Year that the hours are long and tiresome, and I think I speak for my entire team when I say that we gave it everything we had! At times, our service consisted of simple, sometimes tedious tasks: cutting out decorations, making invitations, painting, entering data, making calls, talking to people at the train stop, designing bulletin boards, coloring posters, asking for in-kind donations, all on top of co-planning with teachers, making tutoring plans, writing emails, planning events and keeping track of our students. Needless to say, the to-do list can go on and on and on. 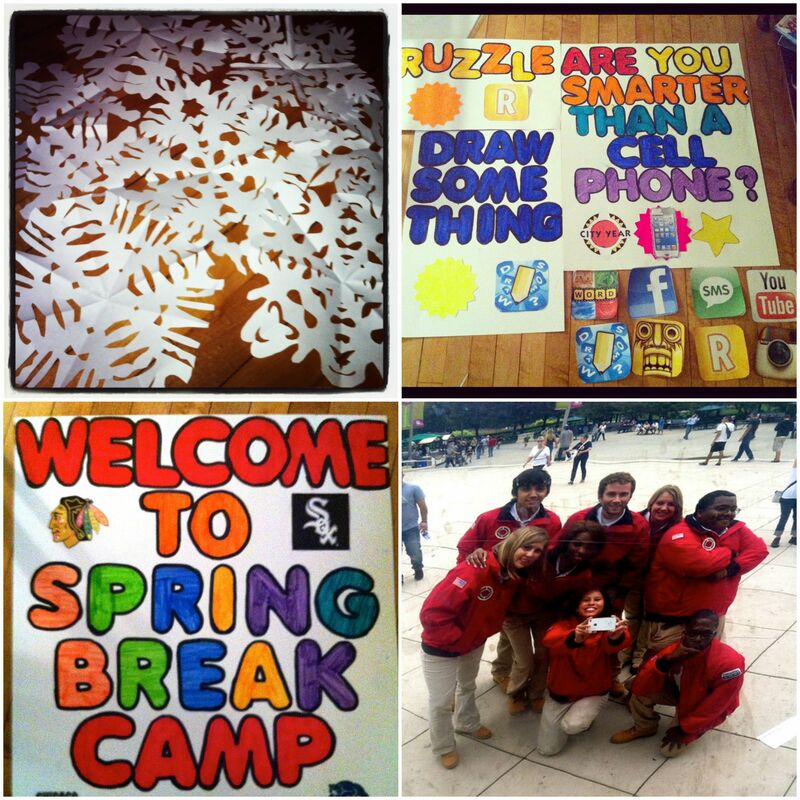 Here are examples of some of the smaller tasks we did for school and community engagement events. The PITW (Putting Idealism to Work) saying, “Students first, collaboration always,” became our mantra. And often, we made great strides with our students. Their grades and attendance improved, or they learned to make better choices in class. But we soon learned that even when we believed so strongly in a student’s potential, that belief didn’t always translate to successful outcomes. We saw this happen more times than we wanted to. And it was hard not to be disappointed. The emotional drain that occurs when you are so close with a student, and they make a mistake that gets them, again, off track, suspended, or failing, is a feeling that goes home with you. In the national service and the education community, it is not easy to keep our personal and professional lives separate from one another, and in all honesty, though some say I’m a bit of a workaholic, I’m not sure we should. What can feel even worse is when a circumstance that is beyond anyone’s control takes away a student’s chance at success. Our society’s idea that every individual has an equitable chance to get a good education and make their dreams a reality was sorely disproved, every time I saw some of my students trying their very best, only to be knocked down, and at times, severely damaged by the environment in which they were living. Sometimes the problems we were trying to solve daily in City Year felt too big or overwhelming. That’s why it was important to find things that could instantly make you happy, get you laughing, and inspire you to keep going. For me, that was discovering the glories of Chipotle and binge watching Amy Poehler’s hit NBC show, Parks and Recreation. And let’s be real. I was a small-town girl from NC living in the overwhelmingly big and fantastic Chicago. Staying in my apartment and having a Parks and Rec marathon was often much easier than braving CTA and exploring the Windy city with little money to spend on nights and weekends. This was also a great show to watch while cutting out snowflakes or working on small projects. 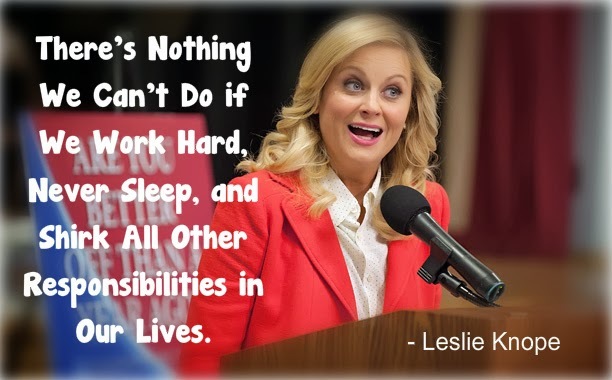 Leslie Knope’s endearing optimism and passion to make a difference in her town became contagious. She reminded me that no action is too small and no problem too big, as she humorously and metaphorically took on the task of filling in the pit and building a park in the first season. The recent finale of this quality series had me grieving and walking down memory lane. I’m not sure I’ve ever laughed so hard or felt so deeply connected to a television show and its characters. And I’m not the only one who has been inspired by this series and Amy Poehler (just check out the SMART GIRLS Twitter handle). 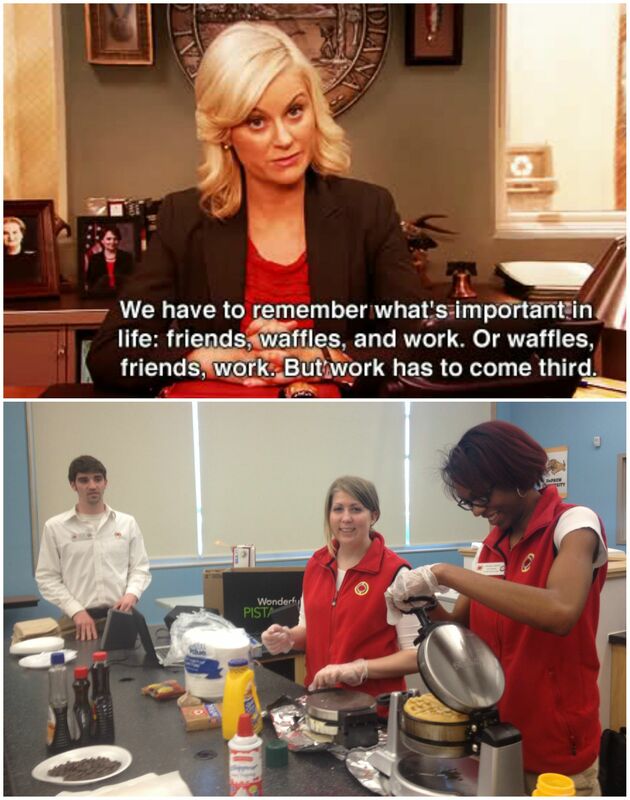 Making waffles for students, WITH friends, AT work. Can’t get any better than that! Because of Amy and Leslie’s character, I have learned to work like a “rocket ship,” to keep chipping away at my to-do list, and to never be held down by the pessimistic Ron Swansons in the world! And on those days when it is incredibly hard to remember your “why,” in such intense work, Leslie Knope says it best— “We do it because we get the chance to work hard at work worth doing, alongside a team of people we love.” That’s true for me as well. I could go on and on about what I got out of my service year, but by far the best part was the collaboration – the energy and love I found in my team. Thank you Cindi, Charlie, Alisa, Tiffany, Jordan, Stephanie, Luis and Ryan. You guys continue to inspire me and remind me of what a team can be!